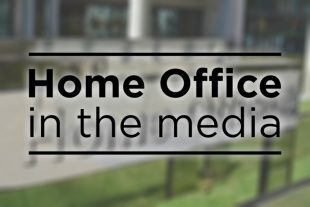 Today's Home Office related stories include reports of announcements at the Conservative Party Conference by the Home Secretary related to future immigration system post Brexit, violent crime and a review of drug misuse, along with a story on taser use. The Guardian reports on figures that show mental health patients have had a stun gun drawn, aimed or fired at them over 100 times in the past year. According to the piece, campaigners are vehemently against their use. The piece carried a short sentence stating that the Government has said that stun guns should be used only as a last resort. We are committed to giving the police the necessary tools to do their job. TASER provides officers with an important tactical option when facing potentially physically violent situations. The Government is clear that all police use of force must be lawful, necessary and reasonable in the circumstances. Use of force in mental health settings, including the use of TASER, a form of conducted energy device (CED), should only be used as a last resort, where possible de-escalation techniques should always be the first response. The deployment of TASERs is an operational matter for Chief Officers and it is for them to determine the number of devices and specially trained officers based on their force assessment of threat and risk.